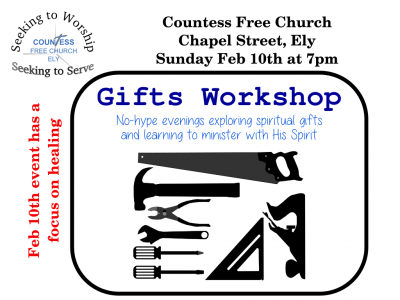 Our next Gifts Workshop is Sunday 10th February at 7pm. This particular evening has a focus on healing. Anyone who would like prayer for healing is welcome to come! Each of our Gifts Workshop sessions is suitable for adults and youth. It has some practical teaching, and then space for prayer ministry where the less experienced can learn from the more experienced. On this occasion we will be praying for healing – so if you would like to simply come and receive you will be most welcome. From our sessions everyone who comes goes away feeling encouraged – so please feel free to come along and join in!